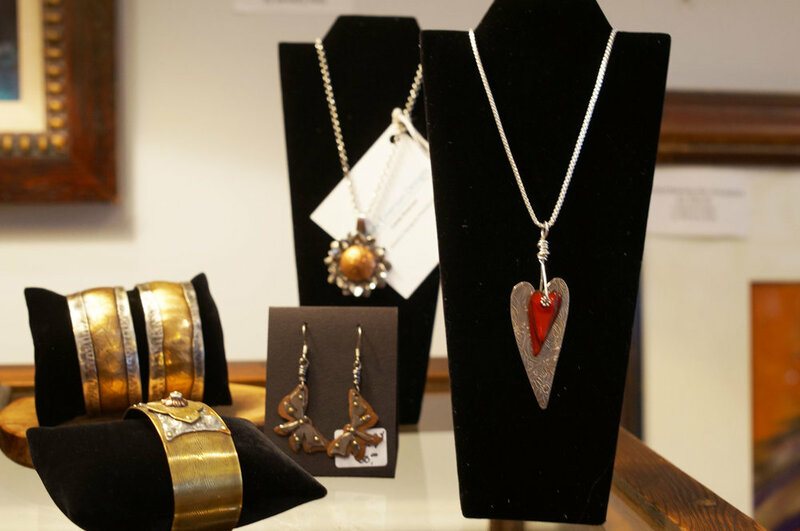 We are fortunate at Firefly Craft Gallery to work with many of the very best artists in Henderson County and all of Western North Carolina. Our gallery is filled to over-flowing with their creative genius, whimsey, love of color and light, and their passion for touching your heart and soul through their art. Here are just a few of our favorite local artists. Scroll down to see Artist Bios and samples of their work. All of my designs are original and one-of-a-kind. Although I have a B.A. Degree in the Arts, I am a self- taught doll maker. I have no formal way of beginning my process. I just start playing with textured fabrics, paint and digging through my many boxes of treasures. From there I start cutting and feverishly mixing and matching. Following my bliss, I create all the little monsters and characters of my imagination. Every once and a while, I will create a little sketch or paper pattern just to keep me in line. People often ask: "What inspires you?" The answer is simple: Everything! I am inspired by my children, all the places I've explored and the people I have met. My passion for detail is intense. My need for laughter and humor is a must! Whether I am people-watching in the city, antiquing, or jumping around a junkyard, my creative pulse is constantly beating. Historic Saluda, NC has been home to David since he was just a baby. Growing up in the foothills of western North Carolina, David always enjoyed working with his hands and had been doing woodcarving for several years until several shoulder surgeries made that impossible. He then attended Tryon Arts and Crafts and he discovered he could use his considerable woodcarving tools and skills to create beautiful details in clay. David then built his own wood fired kiln and has been creating intriguing ceramic art ever since. Through many years of experience and experimentation, David has developed a unique style and a well-deserved reputation for one of a kind ceramic designs. You can find David's wonderful mugs, bowls, vases, and lamp bases at Firefly. Born in London, England and raised in New York City, Kathy found her passion and started her stained glass career in 1981 and never looked back. Kathy moved to Hendersonville in 1990 and found inspiration in nature and specialized in 3-D birds and flowers. Her real love is to produce stained glass spider webs which have been her most popular work. Kathy's work is best enjoyed when catching the sunlight through a window! Stained glass spider web is perfect for any window! Joyce Henneberry received a degree in graphic arts, and her work has been featured nationally in trade publications. Joyce has designed several published books as well. She draws inspiration from both nature and the abstract. Whatever the project, her passion is experimenting with and arranging unusual colors together. Mark Henneberry is a wood carver from Brevard, NC. Mark has been fascinated with wood carving from childhood. As a child he whittled and made walking sticks and as an adult he developed a deep interest in mountain spirit carving and historic folk art carving. Mark's background is in design and advertising. For many years he owned a graphics arts firm and designed commercial advertising. Mark is the beginning wood carving instructor at Isothermal Community College. Donna Martin is an award winning artist specializing in custom designed glass windows and doors, as well as beautiful sparkling decorative hangings. Donna's art is perfect for your favorite window, garden, porch, or any place you would love to watch light play on her gorgeous stained glass creations. Janet has been intrigued with organic qualities of clay from a young age. Trying to retain a living and dancing quality when working the clay has been her goal. Janet uses "slung slabs" on the collar area of vessels and as ears or beaks on her animal pieces. These slung slabs stretch and infuse her work with a permanent sense of movement. Born and raised in Hendersonville, North Carolina, Don Blackwell's pen and ink images reflect his love of the Blue Ridge Mountains and the inhabitants. Don spent 23 years in the United States Air Force as an artist, and almost 30 years in Alaska. He has returned to the mountains of North Carolina to pursue his love of art and teaching others how to do their own art. A versatile artist, Don's works are done in pencil, pen and ink , watercolor, airbrush, and colored pencil. He is also creating work in a unique form of expression called pyrography or burning an image into various mediums. Don also carves in wood, crafting mountain wood spirits on hiking sticks, canes and larger pieces as well. His originals and prints are in three museums, the Ministry of Defense in Winnipeg, Canada and the Ministry of Defense in Moscow, Russia, the Pentagon and the National Guard Bureau. Candy has been designing and handcrafting jewelry for over 10 years, with a focus on fabricating metals. She loves to take raw metal and shape, texture, and embellish it to create a unique piece of fine quality jewelry. Jennifer is a jewelry and mixed media artist, originally from upstate New York, has lived in Hendersonville, NC for the past 19 years. For the past several years, Jennifer has combined her love of ceramic beads and metal into creating beautiful leather bracelets. These elements all come together in perfect union and stand out in one-of-a-kind bracelets; all have magnetic closures. These beautiful bracelets are the perfect focal piece for any occasion.